Tuesday last week, the 4th of July, the Advanced Manufacturing Growth Centre (AMGC) held a symposium on Advanced Manufacturing. The keynote speaker was Behrang Poorganji, leader of GE’s Additive Materials Development in the USA. Certainly enough reasons to fly up to Sydney. So here comes a brief summary of the event. The event was hosted by the University of New South Wales (UNSW) in Sydney. With over 180 registrations from industry and academia, the room was filled with experts sharing a common interest in advanced manufacturing in Australian. Michael Sharpe, Director of the Advanced Manufacturing Growth Centre (Eastern Division), welcomed the attendees. Michael sinformed about the current activities of the AMGC and trends in the Australian manufacturing. Further, he pointed out the importance of investments in research and development and the clear benefits of collaboration of industry and academia. He encouraged Australian industry to invest into research and development, to maintain a competitive edge by developing innovative products and better services. Tradiebot is developing repair processes for crash repairs. The company successfully developed a repair process for automotive headlights. The process is based on 3D scanning and reproduction of broken clips and mounts through Filament Fused Fabrication (FFF), a 3Dprinting process. Currently, the company is working on a robotic panel repair process in a research collaboration with Swinburne University. The aim is to replace repetitive tasks through automation. But Mario shared more insights on how his staff is coping with a higher automated work environment, addressing the skills gap in trade jobs and how to up-skill the workforce. Peter McKinnon, managing director of Rotacaster was sharing details on the Omni-Wheel. 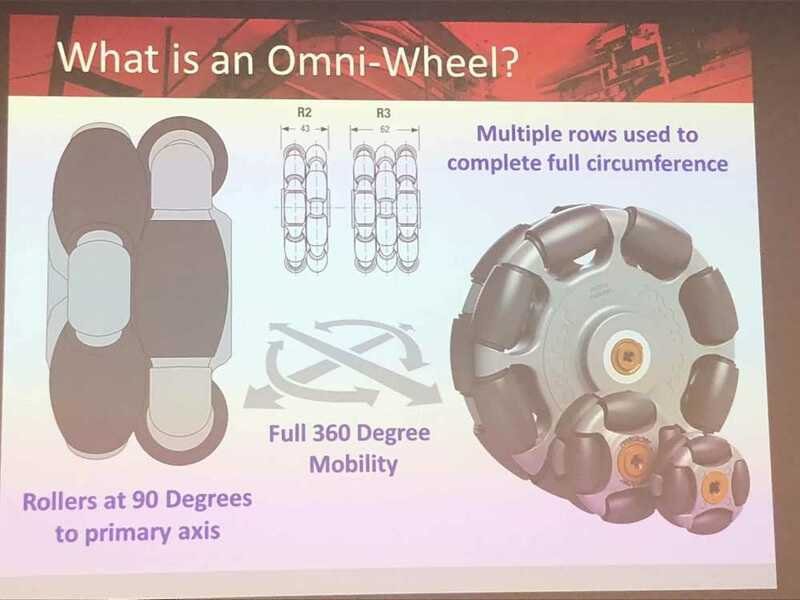 Peter explained that omni-wheels are used in various applications from conveyors, even on military C17 transport planes, to robotics. The company is counting large brands to their customers and is producing their products in Australia only. But Rotacaster is exporting over 20% of its total production. Lochie Burke, CMO & Co-Founder of JAR Aerospace, shared the impressive path of four friends taking a project to a 20 staff company. All that without any grants. Now JAR Aerospace is producing UAVs for the Australian Defense Force, agriculture applications, mining sights and even working on a project for automated drug delivery. The business also has an arm focussing on education. Last but not least Lochie shared the companies plans of expanding to solutions for aerospace. 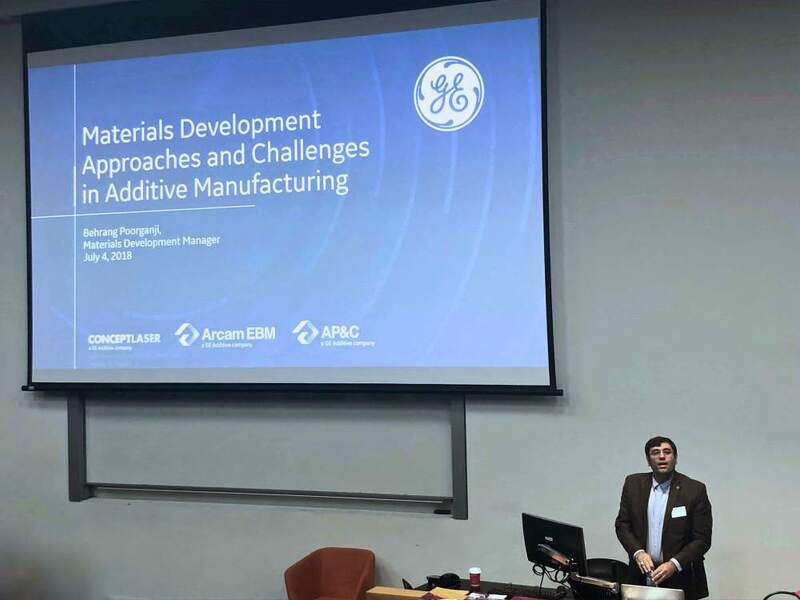 Behrang Poorganji, leader of GE’s Additive Materials Development in the USA, was the keynote speaker. Behrang covered in his presentation a vast range of topics. From the process fundamentals to micro defects in additively manufactured parts. Starting with an introduction to the different metal additive manufacturing (AM) modalities. Further, Behrang was providing an overview of use cases of metal AM technologies within GE’s aviation business. He was talking about the industrialisation challenges in Additive Manufacturing, actually calling it ‘the pain it takes’ to achieve FAA-certification for flying components. Behrang was addressing the huge challenges of metal AM in production, from process stability to in-situ monitoring, saying every production machine is heavily modified and carefully monitored. Behrang pointed out the benefits of additive manufacturing not only for aero components. Of course, the famous LEAP fuel nozzle was mentioned. Just the fact that the five-time increase in lifetime of the nozzle was pretty much just a side effect, resulting from the design for additive manufacturing, was certainly news. The most impressive number Behrang shared was GE’s aim of internal cost-savings of a total of USD 5+ billion through Additive Manufacturing. Behrang also talked the limited choices of engineering materials / alloys currently available for AM. Further, he addressed the efforts it takes to develop new process parameter, mitigating metallurgical defects like tearing and solidification cracking. Behrang pointed out that the most crucial factor is the right design for Additive Manufacturing (DfAM). Closing with a view of the future potential of metal AM by being able to actively utilise the anisotropic material properties of laser-based powder bed fusion. David Chuter, CEO of the Innovative Manufacturing CRC (IMRCR) addressed the aim of the IMCRC to finance manufacturing research projects. Support begins with projects from AUD 300k as a dollar by dollar match. The projects funded so far were typically around one million dollars. The IMCR still has to distribute 13 million of the initial 30 million dollars. Shared in his presentation insights of activities. The research is improving crash-behaviour of helicopter cells. of the AMAC Centre and the amusing motto: ‘Make, Bake and Break’, referring to the process of creating composite test samples. Later the afternoon a tour of the lab was offered to highlight the testing capabilities and processes. Later a tour to the lab offered where Matthew David, the Centre Manager, showed us the equipment, capabilities and explained the current research activities. Scientia Professor Veena Sahajwalla, Director of the UNSW SMaRT Centre presented on her activities to fight e-waste. Veena’s work is focussing on the development of innovative, sustainable materials and manufacturing processes. The Micro Factory is a systematic approach of robot-assisted recycling of electronic components to recover resources. 3D printing is part of the approach, by separation of polymers, shredding them and using them to produce FFF filaments.